Presentation Zombies, Cyborg and Chimeras - Alternate Anatomical Architectures; and selected videos. Courtesy Scott Livesey Galleries. Curated by Leisa Shelton | Fragment 31. Stelarc (born 1946 in Limassol, Cyprus) is an Australian-based performance artist, who has visually probed, acoustically amplified and suspended his body with hooks into his skin. He pioneered the frontiers of the human body, using his own as a medium and exhibition space– a body that "sometimes seems to include the possibility of terminality" (William Gibson). Artist, icon, a phenomenon, and honoured internationally as distinguished scholar and researcher, Stelarc continues to open up new scenarios on the understanding of the human body related to our time. He has performed with a Third Hand, an Extended Arm and with 6-legged walking robots. He is surgically constructing and stem-cell growing an ear on his arm. 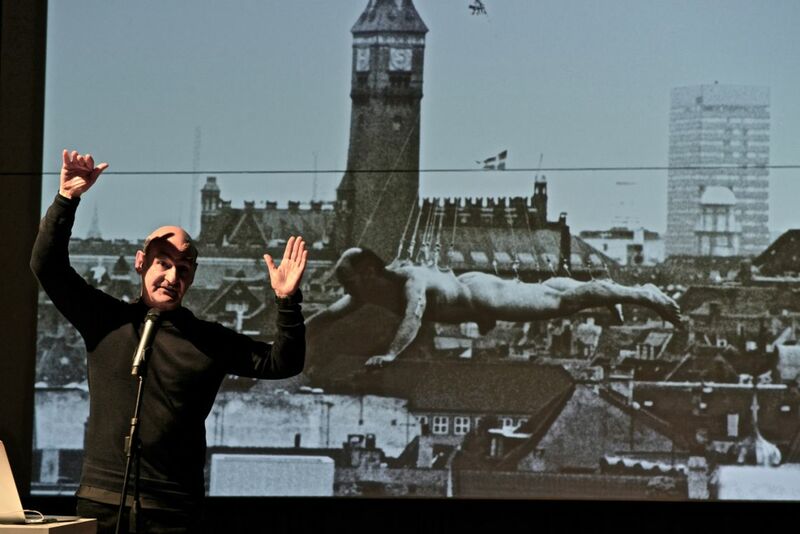 Working in the interface between the body and the machine, employing virtual reality, robotics, medical instruments, prosthetics, the Internet and biotechnology, Stelarc is among the most celebrated artist in the world working in the field of technology applied to visual arts. At the VENICE INTERNATIONAL PERFORMANCE ART WEEK, Stelarc presents Zombies, Cyborgs and Chimeras - Alternate Anatomical Architectures: This is a time of the cadaver, the comatose and the cryogenic. Of zombies, cyborgs and chimeras. The uncanny and the creepy proliferate. The body is profoundly obsolete, absent from its own agency, performing involuntarily and with indifference - in remote non-places. Flesh is circulating, flesh is prosthetic, flesh is fractal and flesh is phantom. Skins collapse into screens generating fluid interfaces. In this age of body hacking, gene mapping, prosthetic augmentation, organ swapping, face-transplants, gender re-assignments, AI and AL, what it means to be other, what generates aliveness becomes problematic. In the liminal spaces of techno-genetics, the body is a floating signifier, neither this nor that, here nor there. A construct of meat, metal and code. REWIRED/REMIXED: EVENT FOR DISMEMBERED BODY is an interactive, online performance that explores the physiological and aesthetic experience of a fragmented, distributed, de-synchronized, distracted and involuntary body – wired and under surveillance. Wearing a heads-up display, the artist sees with the eyes of someone in London, hears with the ears of someone in New York, whilst simultaneously, anyone, anywhere can program the exoskeleton with a touch-screen interface and generate involuntary movements of his right arm. The performance was for 5 days, 6 hours a day continuously. His vision was disconnected from his hearing and his arm was disconnected from his intention. It is as if the body has been electronically dismembered, spatially distributed and possessed with multiple agency. 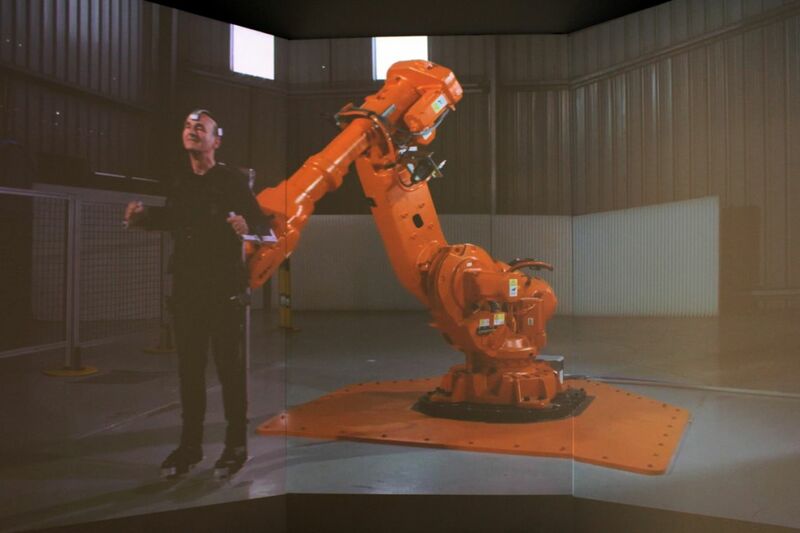 PROPEL: BODY ON ROBOT ARM is a performance where the body's trajectory, velocity and position/orientation in space was choreographed by a 6 degree-of-freedom industrial robot arm operating within a 3m diameter task envelope. The resulting sound of the robot motors registers the kind of movement, acoustically amplifying the choreography. The programming was done off-line then transferred to the robot controller. The performance was done with one of the programmers having his thumb on the kill switch, in case the robot did something unexpectedly. The body and the robot become one interactive and aesthetic operational and performing system. When the choreography was completed, the body was replaced by a large sculpture of his ear. The robot that choreographs the ear is the same robot that carved it. EAR ON ARM SUSPENSION is a performance where the body was suspended above a 4m long sculpture. 16 hooks were inserted along the back of the torso, arms and legs to equally distribute the body’s weight. As it was winched up, the body assumed its full weight, stretching its skin. Because of the braided steel cable untwisting as it assumed the full weight, it begins to untwist and the body begins to spin, first one way and then the other. What was first imagined as a 5 minute performance ended up being 15 minutes. The performance was about a counterpoint in scale. 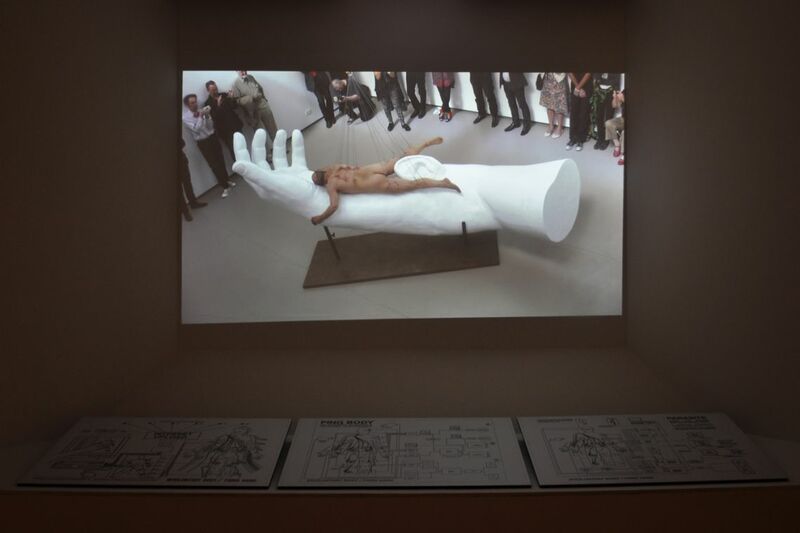 A whole physical body suspended above a larger fragment of the body - the ear on an arm. The body becomes an object in a sculptural installation. 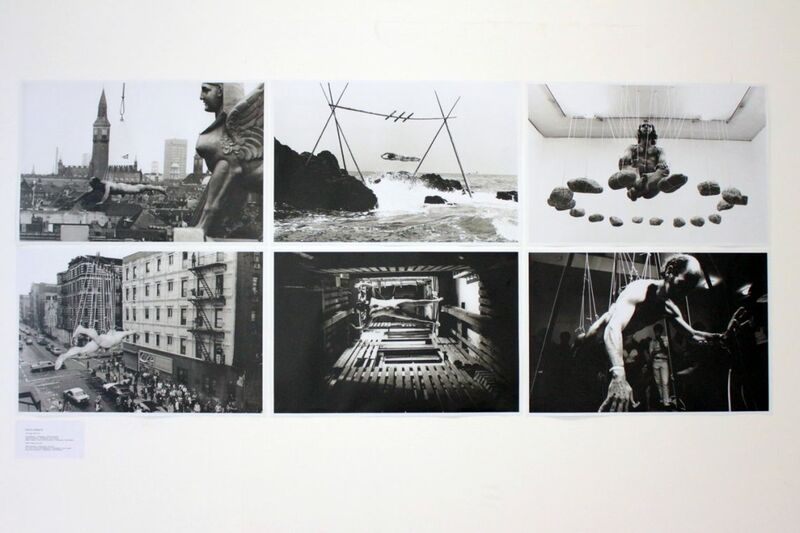 The performance began when the body was hoisted off the sculpture and ended when the body touched down. Presented with the kind support of CURTIN UNIVERSITY and SCOTT LIVESEY GALLERIES.